New Paltz Brewing Co. (Pfälzerbräu). We are a historically named brewery. 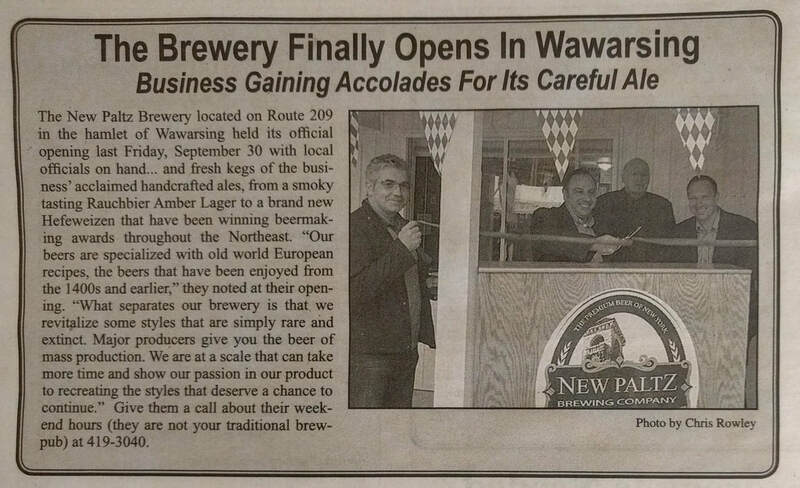 Brothers from German Heritage growing up in the Catskills, NY & New Jersey, now making old world handcrafted German Style Beers in the Hudson Valley, NY. The name recognition incorporates the correlation of the French Huguenots that claimed settlement naming the New Paltz region after the Pfalz region of Mannheim Germany. Such an interesting history, we found as a perfect compliment to continue the historical likeness. Pfälzerbräu, meaning: Brewery of the Pfalz. We make Handcrafted Lagers and everyday we make it, we’ll honor to make it the best we can. You have many choices in beer, we are one of the very few breweries in the United States that make a true fresh handcrafted beer. Our beers are specialized with old world European recipes, the beers that have been enjoyed from the 1400s and earlier. What separates our brewery, is that we revitalize some styles that are simply rare and extinct. We also brew our beers using traditional handcrafted methods. Major producers give you the beer of mass production. We are at a scale that can take more time and show our passion in our product to recreating the styles that deserve a chance to continue. We incorporate premium grains, brew with some modern equipment using traditional methods and use the best -New York mountain water to bring to you a Pfälzerbräu beer. We are not a brewpub, our efforts are focused on beer. We are a local production business geared towards giving jobs and opportunity back to the local community. This doesn’t happen over night, and thank you for your support. The local Hudson Valley area is a historical part of New York State. European settlers helped develop the area. We feel our European style beers are best enjoyed here and work very well in complimenting the area. Our Smoked Rauchbier has a simple and mild smokiness with a distinct color, taste and quality. Best enjoyed while overlooking the local Shawangunk Mountains. Our Kellerbier also adds curiosity. An extremely rare early Franconian recipe with overtones citrus, with fresh taste and amber in color. Very easy to drink and best enjoyed in earthenware mugs. One sip and you’ll be ready to pull out your Viking hat. Our Hefeweizen, a simple old style. It truly carries taste with our world famous and highly renowned New York water. Please stay in contact for upcoming releases. Support New York, support local. Prost! ​It is with heartful sadness to announce the passing of my brother Jeffrey Giesberg at 46 years young in early November 2018. He was a beloved son, an amazing thinker, inspirator, supporter and phenomenal true brother. He will be greatly missed.